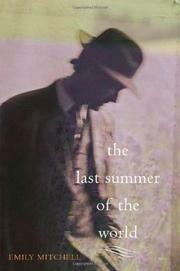 A debut novel about Edward Steichen, photography, WWI and a love triangle. Steichen was already an accomplished photographer and living in France with his family when the war broke out. His relationship with his wife Clara had gradually been deteriorating, however, owing in part to her suspicions, some of them justified, that Edward was engaged in illicit relationships. (There was also the issue of Clara’s neurasthenic and hypersensitive personality.) When the U.S. joined the war effort in 1917, Steichen signed up for the Photography Division of the Army Signal Corps and took some of the first strategic aerial photographs from the dangerous open airplanes of that time. This novel focuses on Steichen’s career as a captain in the Corps but also provides insight into his past life as husband, father and lover. Mitchell has chosen an innovative and unusual narrative structure of chronological fragmentation. The novel begins in June 1918, with Steichen back in France in pursuit of aerial intelligence that would help the war effort, but each chapter also provides a flashback, a glimpse into Steichen’s prewar (and initially more idyllic) world. The catalyst for each flashback is a Steichen photograph (example: At the Piano. Paris, 1902. Platinum print). Mitchell establishes a context for individual photographs and deftly handles moments of personal crisis in Steichen’s life and career. The cause of much of Steichen’s anguish is Clara’s friendship with Marion Beckett, at first a close family friend; however, an even closer friendship and amorous relationship arises between Edward and Marion, leading Clara to take action. A novel in which the chaos and fragmentation of war mirror the chaos and fragmentation of personal relationships.